Why don't you think to decrease costs by increasing productivity? We propose to convert your old and inefficient peripheral equipment more efficient for maintaining and increasing production. The old mechanical feeder requires overhauling. Finger adjustment (preparation) takes a long time. It makes a short stoppage very often. A lifting function is required. We want to make feeding dimension variable to meet work dimensions. It is possible to revive obsolete equipment of slow speed, and also to add new functions for increasing productivity and for coping with a wider range of production. Increased motion patterns for selecting most appropriate transfer. Simpler maintenance eliminating to inspect inside the pit by changing to servo system from mechanical. We can cope with various types, from small and intermediate presses to forging presses to large presses. The performance equivalent to a latest type is available. 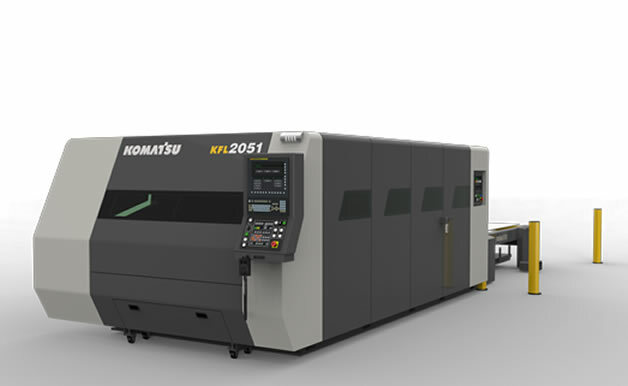 The function of your machine will have the same construction and function as the Komatsu's newest transfer feeders. 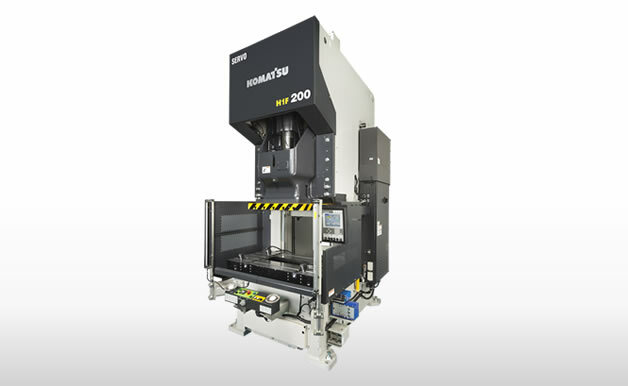 Komatsu can replace your obsolete mechanical feeder with a latest servo feeder. And we can also work on upgrading your control systems and mechanical systems to be used for a long time from now. Consult with Komatsu if you have a trouble with your feeder. We have our transfer feeder upgraded from a two dimension type to three. With the previous old machine, feeding speeds were slow, and adjusting to multiple products was impossible. Now we can feed in optimum timing by setting motions. Our throughput also increased by converting to the three dimension type. 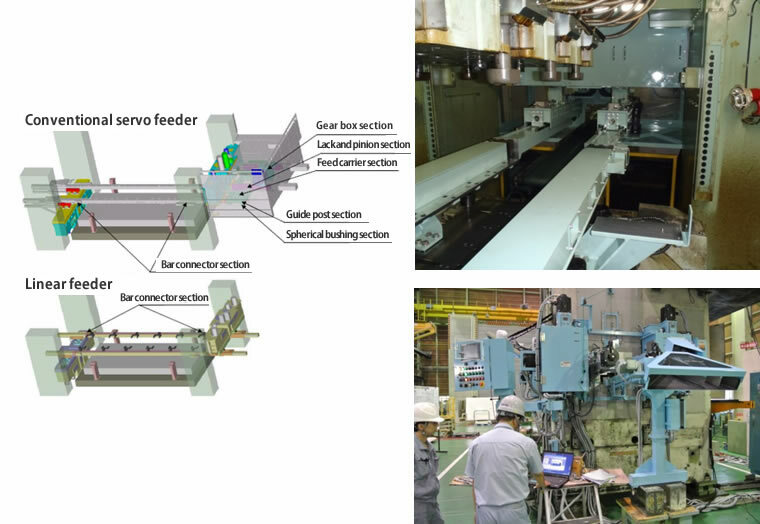 We had considered to convert our feeder to the three dimension type, but didn't because we were anxious about space and reduction in production numbers. 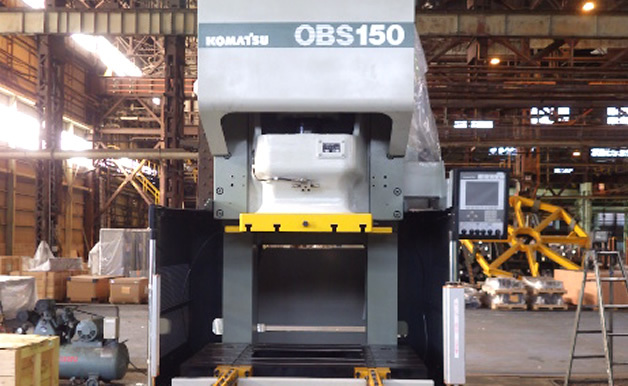 But this time we ordered to Komatsu, and they increased rigidity of the bars for improving stability to increase production amount and to cope with multiple products in the narrow space. We are grateful to them for that and also that the major components have been changed to the latest versions not to worry about supplying replacement parts.